The bathroom is a functional place where we start and end our day, but this doesn’t mean it has to look boring. 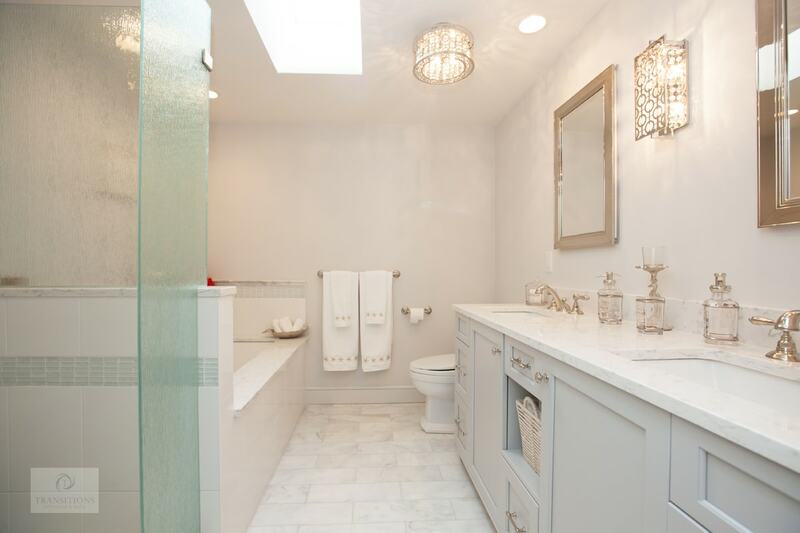 Why stick to a tired, bland bathroom design when you can bring Hollywood pizazz to your daily routine? Whether you’ve given other rooms in your house a fix of glamor, or just want to go to town on your master bath remodel, look no further than our tips on how to achieve a show-stopping bath design. Lighting is important when creating a feel of opulence and luxury. 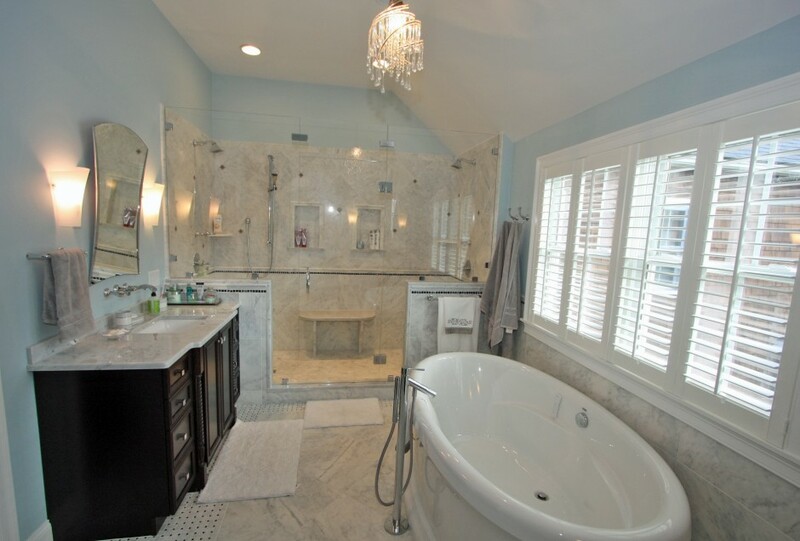 Chandeliers instantly make any room grander, including a bathroom. Gold is the metal of choice for glamor and should be incorporated from pendants to light switches. Any crystal light fitting give an old-school 80s touch of glamor too. Elaborate sconces either side of a mirror, or light bulbs all around one, bring Hollywood to your master bath. This crystal droplet light fixture paired with art deco sconces provides instant glamor for this master bathroom design in Marshfield. 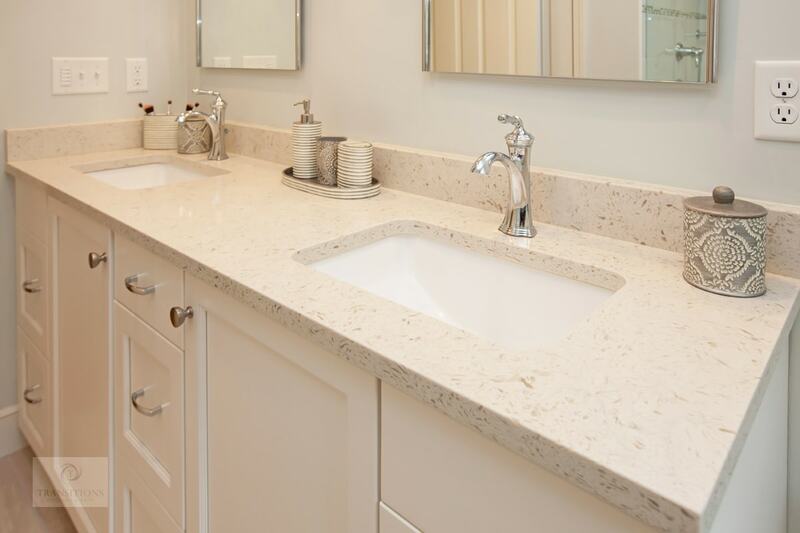 Marble undoubtedly brings glamor to bath remodels, but engineered quartz is just as effective and is more durable. The silver veining of this type of backsplash or countertop subtly lifts your vanity table to another level of luxe. Sunken tubs make you feel like Cleopatra and freestanding bathtubs, especially vintage-style models with claw feet or sleek architectural models, give the illusion that you’re stepping back in time as you immerse yourself in the water. A large, frameless glass shower enclosure, complete with a built-in seat for relaxation leaves you feeling like a movie star after your regular shower. 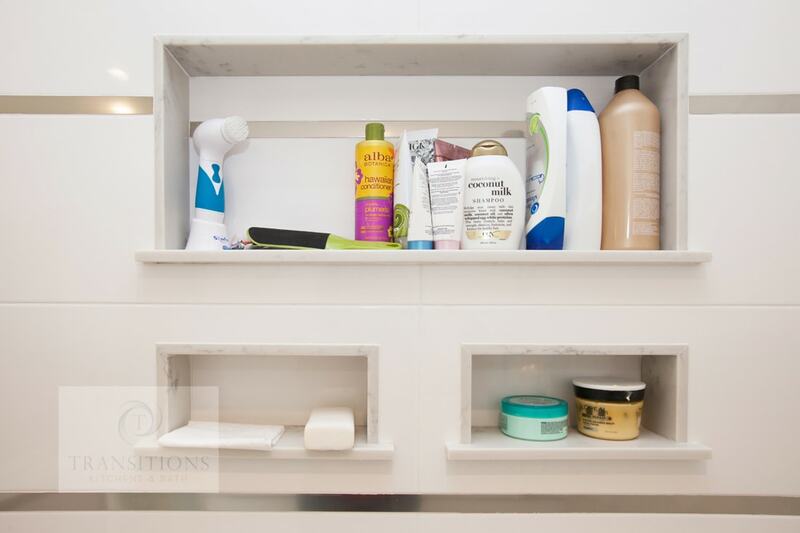 Set up an area where you can put on makeup or pamper yourself, spa-like, after a bath. Include a chaise lounge or a cushioned bench to relax on after you get out of the shower or bath. Make sure you add a radiator style towel warmer so you have warm towels at the ready when you want them. Turn your vanity cabinet into a glamorous statement by choosing a unique furniture style vanity. Look too, for vintage-style pharmacy cabinets and vanities and embrace gold, mirrored cabinet fronts, and lacquer! Crystal doorknobs and gold or other bright metallic faucets, sink stoppers and drawer pulls accent the room with panache. 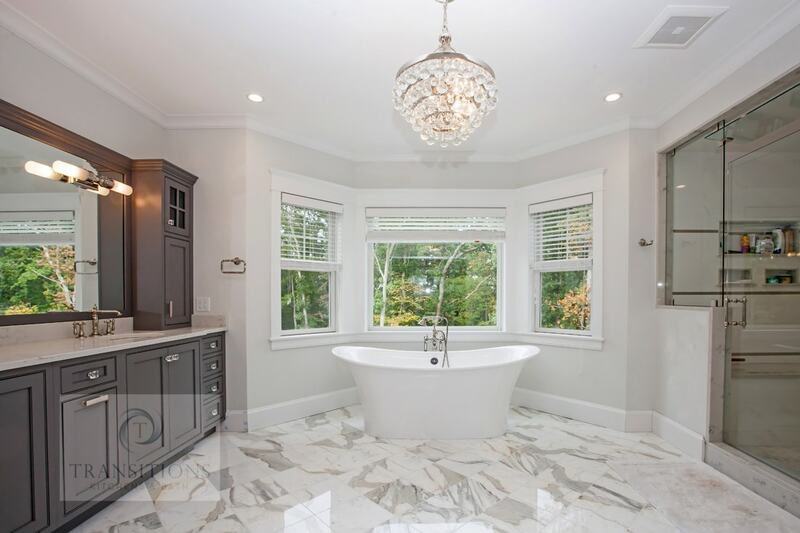 This master bathroom design in Hanover makes a big impact with its metallic finish lighting fixtures, soap dispensers, rails and other accessories set against the sophisticated quartz countertop around two sinks. Mirrors are another key element of creating a glamorous bathroom. Avoid frameless or minimal designs and opt for large and intricate frames, especially gold or antique ones to bring old-world formality to the room. Strategically placed statement accessories, such as sculptures or candlesticks, add drama and character. Finally, invest in high quality matching towels to put the finishing touch to your efforts. Dark, rich wall colors like grays or browns work well when set against brilliant white tubs and tiles. Painting and accentuating alcoves make a room appear bigger so don’t be afraid to add furniture or shelving to them. Simple but bold patterns such as stripes look magnificent in a curtain around a tub, especially a sunken tub. Billowing, white lace curtains romantically dress a window, as will generous roman blinds in neutral colors. 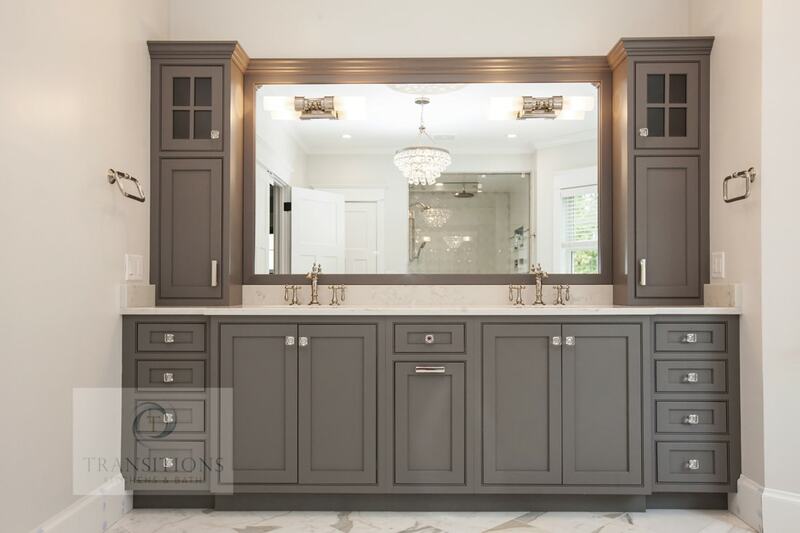 Gray is a safe neutral, but when paired with ornate mirrors, gold or bronze accessories, or crystal chandeliers can really bring a glamorous vibe to your bathroom design. Just including these few elements in your bath design really maximizes its glamor potential. Why not look at our gallery for more bathroom design ideas to inspire you? Contact our design experts today to help put the wow factor into your bathroom. Hardwood vs. Wood Look Tile? What is Contemporary Bath Design? 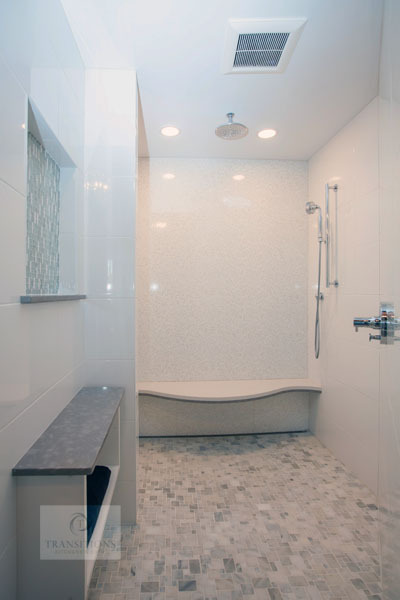 Why Choose an Open Shower Design?